Are you sick and tired of aluminum subframe bushings beating you up when you go for a pleasure drive to put Shelby Mustangs in their place? How would you like the performance benefits of aluminum subframe bushings but the comfort of rubber (to a point)?! I can start producing polyurethane subframe bushings. I have been in talks with my poly supplier and they have given me a quote and information on producing these bushings. They will have dimensions based off of the stock bushings and will be a 2-piece design like 034's aluminum bushings (and others that have made them). They will be in 95A (stiff stuff) durameter which will provide the performance benefits similar to aluminum but will also not rattle you apart and absorb vibrations AND road noise a hell of a lot better. In order for me to start producing these, I need about 15 cars (30 subframes) to get on board with my initial order. Since I'm already down for a set in my car (I am sick and tired of the aluminum ones), I need another 6 cars to sign up. I will stock these in BLACK only! Please pm if you want a different color! THIS MAY CHANGE THE PRICE! Price: Each subframe set will retail at $80 meaning $160 per CAR. I am offering a one-time pre-order incentive of $75 per subframe to get the ball rolling. My retail cost may be higher than $80 due to unforseen costs. I w Please share and inform your fellow Audi enthusiasts about these. Thank you! Last edited by AngryTaco on Wed Mar 05, 2014 11:00 pm, edited 12 times in total. I would be interested in a set, do you have any others in line? Need a down payment? Yes we already have about 5 cars signed up. Once I get 10 dedicated people, I'm sending out invoices for the pre-payment. I'm updating the thread right now with those interested parties. Are you interested in one sub-frame set or an entire car worth? Any plans for control (stamped/cast) arm bushings for the B3/B4/B5? This thread is pretty old and probably doesn't have the latest updates on the pre-order, but above I count 19 of the 30 sets. Are there any more sets available at the pre-order price? I need at least one set for my CQ at this time, and perhaps a second set at some point. My motivation and interest in my CQ just got a huge boost having obtained a good dashboard to replace my horribly sun-destroyed one, which was a big buzzkill. I am finalizing some of my suspension bits and will be installing a Whiteline rear sway bar along with a subframe swap from a later model CQ that has the bar mounts. I just pressed out the old bushings and need some new ones to continue. 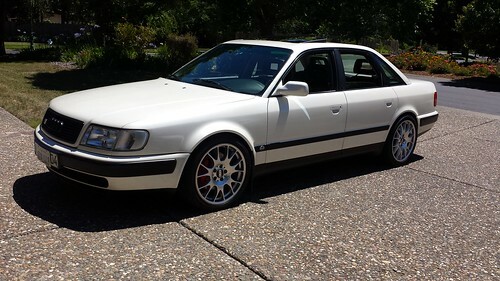 For the front I'll be swapping in some cast control arms from a B4 90Q donor and an RS2 front bar. The CQ is sitting on KW coilovers and I have one pair of Mance/VAP sway bar links but I need either a set of rear stock links or another set of custom links for the front. That will be a nice setup for sure. Hell I bet it will make Dave jealous! I have a little feedback now that I have installed these. Overall, im pleased with fitment and quality. I do think you might consider putting a heavier gauge sleeve in the center. The supplied sleeve is quite thin and easy to distort if you overtighten the bolts. I wasn't able to get a nice tight fit that inspires confidence. If you tighten them to the point where they feel right, the sleeve wants to deform some. Just my thoughts, overall I'm pleased with them. dana wrote: I have a little feedback now that I have installed these. Overall, im pleased with fitment and quality. I do think you might consider putting a heavier gauge sleeve in the center. The supplied sleeve is quite thin and easy to distort if you overtighten the bolts. I wasn't able to get a nice tight fit that inspires confidence. If you tighten them to the point where they feel right, the sleeve wants to deform some. Dana, thank you for the thoughts. On the sleeve material, I have updated the bushings to use a 7/8" 6061 sleeve. They are much stronger, better tolerances, and cheaper for me to produce. If you ever (and this applies to everyone) want the updated sleeves, let me know or send the bushings back to me and I will bore and send them back with the appropriate updated sleeves. -do you know if these thin sleeves are a safety concern? I.E. I see it being possible that the bolts cannot be torqued enough to ensure they will stay tight. It would be a fairly significant setback for me to pull both of my subframes back off and send all the bushings back to you, but I suppose I don't want my subframe to get loose when I'm halfway across the country next October. What is the current retail price? gabriel.b wrote: What is the current retail price? "These will fit all 4000 quattros, the urq (Quattro), B3 80/90s + Coupe, and the B4 80/90 (front subframe only!)" I have a B3 coupe, will these fit front and rear as stated in the thread or are they front only? It's a B3, so they will fit front and rear. DE80q wrote: It's a B3, so they will fit front and rear.